Well, all, I promised you cheese for our sandwiches and, unlike most of my other 'Part One' posts, I'm gonna give you the part two for this one! You might remember another post about cheese that I wrote a while back. That cheese was made with hot pour vinyl. The vinyl cheese has an incredibly 'cheesy' look to it. It looks greasy and wonderful. 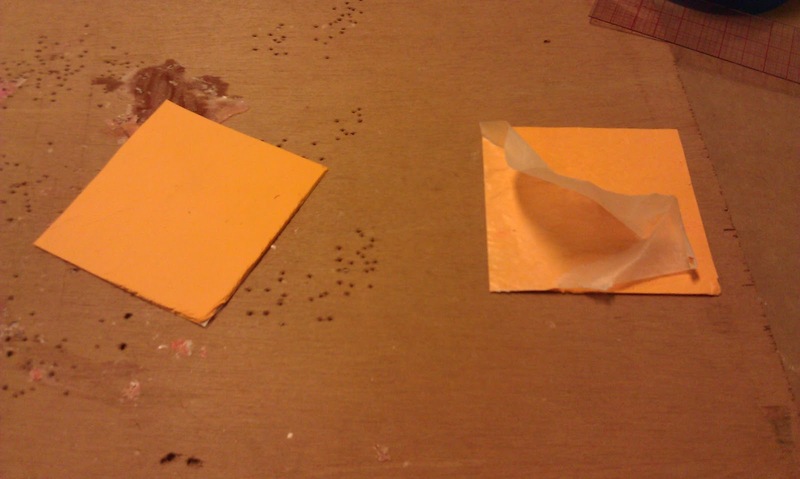 The caulk cheese (insert 12 year old- like guffaw) can be glued to things, and is a little more shelf stable. Plus, if you don't have hot pour vinyl in your shop, you can make this for a lot less money. The sliced cheese is actually incredibly simple to make. Basically, all it is is colored caulk left to dry flat. 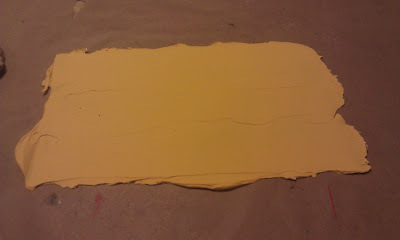 First, tint the caulk to the desired color. I used acrylic paint for this batch, but any water based tint should do it. Then, spread the caulk out until you have a thin, smooth sheet of it. I did my first batch on wax paper, but that got a bit wrinkly. Aluminum foil or plastic seem to be the best way to go, but make sure to avoid wrinkles. Then, I let the caulk dry to the touch. It's going to have to dry on both sides, so plan to peel the backing off and let that side dry, too. You should be able to judge pretty well when the caulk is dry enough for you to peel off the backing, and you can always test by peeling off a corner. If you let it sit too long, it will be harder to peel off, but it shouldn't be impossible. Once the cheese was dry on both sides, I cut it into 4" squares. Huzzah! we will be using this to make our cheese for our food fight in Comedy of Errors in the Park this summer. Maybe cut some holes in it to make Swiss. Thank you for posting.